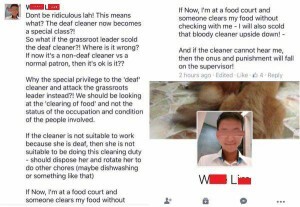 Another scum thinks that the deaf should be disposed. I think this scumbag should be disposed. Previous ArticleTop 5 Rules For Trading/Investing – Stock? Forex? PM? Property? Next Article Indonesian Maid Jailed, Put Urine In Baby Milk Bottle!! !